Everywhere you go, people are heads-down looking at their smart phones. In between Tweets and Facebook posts and email, they are potentially checking out your website. Sales of smartphones and tablets now outnumber computer desktops and laptops, and as website owners we need to consider mobile visitors. What percentage of your total visitors to your website are on mobile devices (and what these devices are). How to see if you have a “mobility issue” on your website. 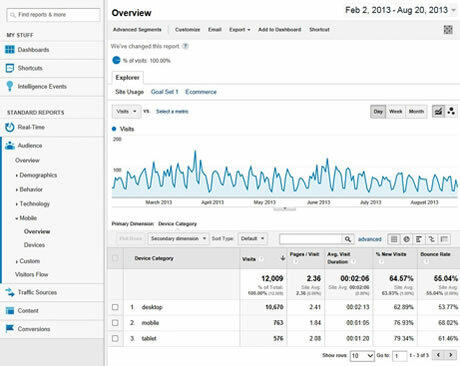 The first step is to make sure you have Google Analytics installed on your site, and that you have access to view your account. Once you log in, you can quickly access your information by. Changing your dates to view the info from the past year, or at least the past 6 months’ worth of data (it’s at the very top right hand corner). The resulting screen info will give you a quick review of the number of desktop vs. mobile VS tablet users. If we click Devices, we can drill further down and see what other types of devices people are using. “Not set” means Google Analytics couldn’t figure it out for whatever reason. If you have over 5% of your visitors from mobile or tablet, I would recommend making sure your site displays properly with a fully responsive design. Once you have determined the number of mobile visitors, you can start looking at any problems you need to fix. You want to focus on Bounce Rate. “Bounce rate” refers to the percentage of people that came to any page on your website and then left right away - this usually occurs when there is a problem viewing or using the site on the mobile device. A bounce rate on a mobile device of 100% (or 80%+) probably means that your website doesn’t display properly on that device - try calling it up yourself to see what your users may be seeing. PS. Hope this tip was helpful. If you have a tip idea or want to chat, contact me here or follow me on Twitter at @envisiontodd. If you are interested in mobile web design, we'd love to talk.